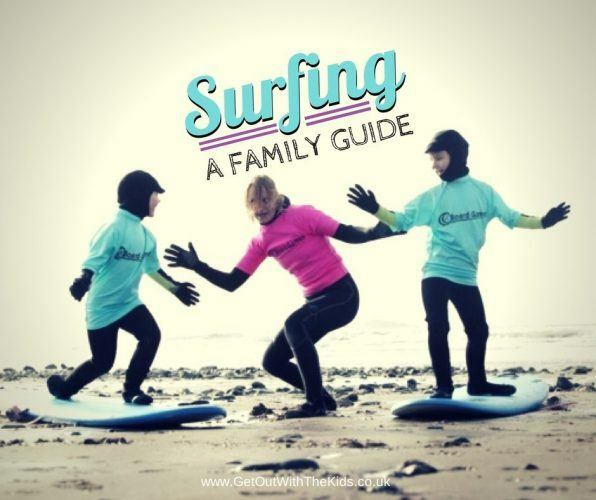 Surfing can be great fun for all the family. In the rain or on a sunny day, it doesn’t matter, it’s good fun any time as you will get wet anyway! The feeling you get from being in the sea = awesome! What age can kids learn to surf? 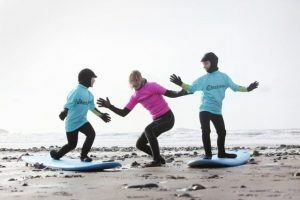 We recommend kids start learning from about age 8 as at this age they seem to understand the concept and begin to be able to catch the waves by themselves! They can of course start before this age but you will have to be there with them, helping them to catch waves, surfing in with them and giving lots of help. you’re never too old to give it a go! As for Mum, Dad, Granny and Granddad…..you’re never too old to give it a go! We encourage everyone to try it, it really is good fun! Technically there can be waves all year round. However the sea is at its warmest in August/September, after the sun has warmed it up all summer! If you have never surfed before it’s a good idea to have a lesson with a surf school as they will give you some top tips and safety advice. If you are heading out without an instructor, hunt out beaches that are lifeguarded. Most of the popular beaches in the UK are covered from mid May until the end of August. The RNLI provides a great service and if you surf in the right area they will keep an eye on you and the family. (Click here for a list of beaches the RNLI Lifeguards watch). They are great for advice too, so head towards them if you are somewhere new and need to know if it is safe and the best spot! 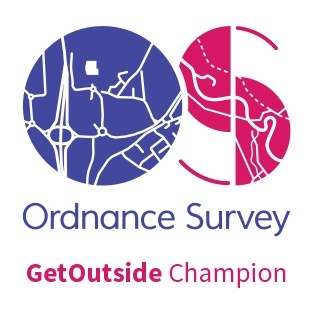 They have a whole world of info online too, lots of safety advice so look them up if you decide to go without a lesson from qualified coaches. (Click here to download the RNLI Beach Safety in the Surf guide). The most important thing is to make sure you stay safe! Sometimes a beach will have waves – they might be small, they might be giant! The most important thing is to make sure you stay safe! Take note of the weather and decide if it safe for you and your kids. A windy day can be fun, but not if boards are flying around like a kite (better to leave the boards and fly a kite!). If you are not sure, best to leave it! The tides are important too, make sure you know what they are up to! They usually go in and out, but this can mean rocks are covered that you don’t know are there, or the beach might all be covered and the waves will be crashing into a rock bank so you can’t surf! Take note of tide times, they can usually be found on a notice board near to the beach. Click here for the Met Office weather and tide time information for beaches. Pembrokeshire is the best (but then we might be a bit biased!) with plenty of beaches to choose from…too many in fact! One of our top ones would be Newgale as it’s big, lifeguarded in season and has the facilities too! 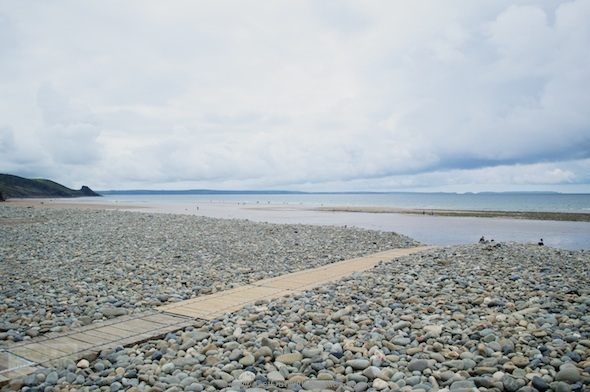 (Click here for Newgale Beach weather & tide info). The Gower is also a fab choice and not as far West as Pembrokeshire, so if you are short on holiday time this is great! (Click here for Rhossili Bay weather and tide times).  Great places, LOTS of beaches to play on here – too many to choose really! Bude and Croyde are popular spots! My personal childhood favourite was Bigbury-on-sea…many good memories there! (Click here for Bigbury on Sea tide and weather info). (Click here for Sandymouth tide and weather info). Scotland – A bit further away for most, but some stunning beaches! The water remains chilly up there a bit longer usually so take those wetsuits! 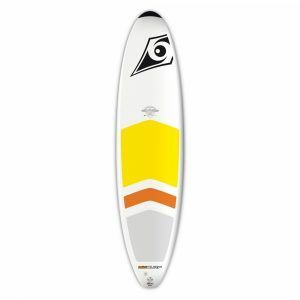 It is important to have a board, it makes things a bit easier (but of course body surfing is an option and good fun!). 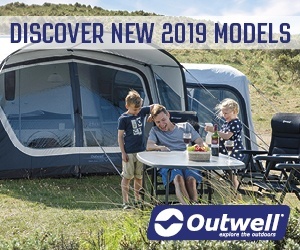 If you are not sure what you want or need get yourself into a hire shop or test centre and try some out, with advice from people that have knowledge! The best boards for learning for kids have a soft top and slick bottom, a little bit more forgiving when they fall near it! 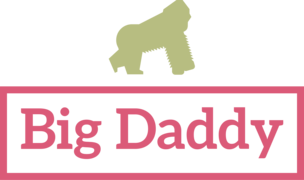 There are so many boards out there to choose but we at Board Games like to recommend the BIC boards as they are super durable, around about the 7’6 mini-mal size is good, for a board that will last until they are a grown up…maybe! This can be expensive if they are still growing, but really do help to keep them warm! 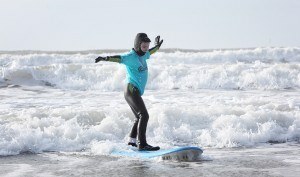 At Board Games surfing we don’t bother with anything less than a winter 5/4mm wetsuit – nice and warm all year round. Make sure it fits and it’s not too baggy as it won’t do much good if it’s hanging off them! A wetsuit works by trapping water between the neoprene and the body…if it’s really baggy it just flushes with cold water constantly! Hoods, boots and gloves – all a great addition, especially if you intent on getting in the sea all year round! They are not essential but if you have the budget, do it, it will keep everyone A LOT warmer! Ear-plugs – A piece of kit that is largely overlooked, but it can save on ear infections from playing in the water! If they really get into surfing too it will protect their hearing in the long run! A key-pod – these are great bits of kit to pop your keys into when you are heading into the water. You attach it to the car and then you don’t have to worry about your keys getting wet! So that’s it…now you know a bit more, go…find a beach, find a surf school, find a wave and go ride it! Enjoy and adventure safe! 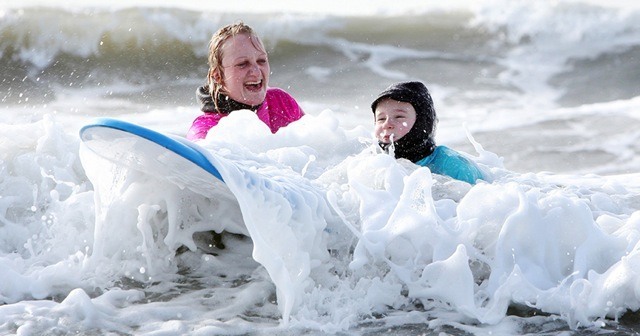 Photo Credits: Photos of kids having surfing lessons c/o Board Games Surfing. Hi, my 12 y.o. 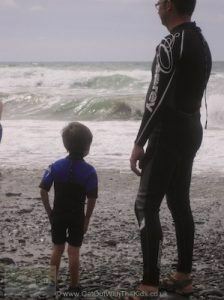 son wants to start surfing with a friend. I am worries about drowning risk/strong tide. I can take him to a beach with lifeguards and I can also watch them from the beach, but any advice about reducing the risks. A worried mum! Yes, a beach with lifeguards is the obvious thing. You said he wants to start surfing. I recommend that he goes to a good surf school. They should teach where and when to surf, which reduces the risks. They’ll also let you know if his swimming isn’t up to it. I’ve seen some schools insist that children wear buoyancy aids until they have assessed that the child is safe enough without one. After all, a school wants the children to be safe and have fun. Some established surf beaches with schools might run clubs at the weekend where kids can surf together but under the supervision of the club. These might be options you want to look into. My son insists that his son age 7 wear a life jacket when he is surfing over his wet suit. I tried to explain that he would not be able to maneuver himself as quickly to respond to the waves and water surge you get. What is your suggestion for a over cautious person who never even swims in the ocean. I can understand their concern, especially if they are afraid of water themselves. Probably the best thing is to send them both to a surf school for a few lessons. Hearing advice from a qualified third party might be the solution.